Uzes was an impromptu stopover on our way to the Pont du Gard, part of the 1st century Roman aqua-duct, built to supply water to Nimes. This lovely medieval village in the Languedoc province, lies at the source of the Fontaine d’Eure and is the starting point of the aqua-duct. The first thing that catches your eye as you arrive, is the iconic symbol of Uzes, the Tour Fenestrelle, also referred to as the ‘Window Tower’ because of its unique paired windows. A free standing circular tower reminiscent of the Leaning Tower of Pisa. 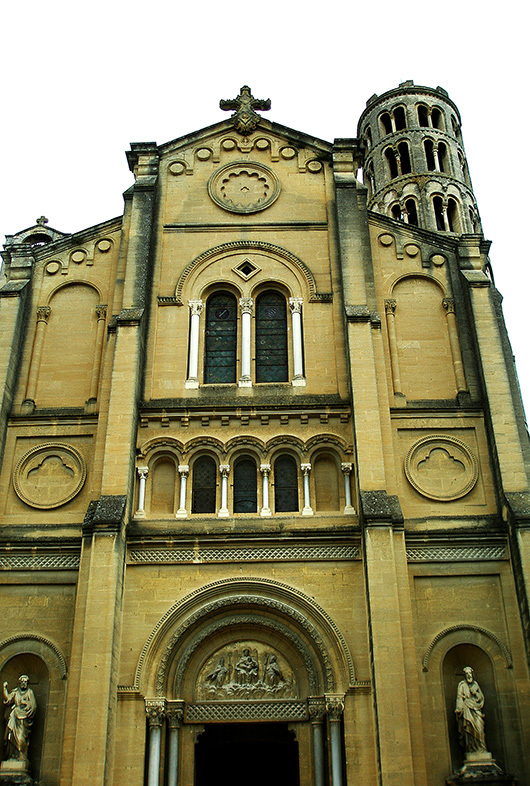 The 42 metre high Romanesque structure is the bell tower of the cathedral of St. Théodorit. The 11th century cathedral that houses the relics of the saint, was rebuilt in the 17th century and the tower is the sole remnant of the original structure. The Romanesque facade of the cathedral was added in the 19th century, but the 17th century organ is still in use and organ festivals are held here every summer. Although we missed the famous Saturday market, the little lanes radiating from the charming central square – the Place aux Herbes – were enticing and we spent a very enjoyable few hours exploring them and browsing the little textile and craft shops. Our enjoyment came at a price however. By the time we were ready to set off for our original destination – the Pont du Gard – we got caught in a sudden downpur, and were forced to abandon our plans and return to Avignon. We never made it back to the Pont du Gard. 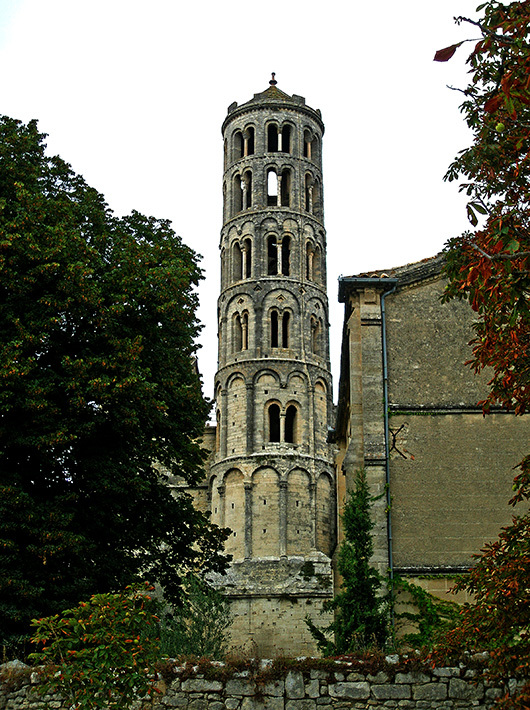 surprised to find “a free standing circular tower reminiscent of the Leaning Tower of Pisa…” in Uzes, France! Schöne Kirche. Und wie ist es innen. Thank you Wolfgang. We didn’t get a look in as the church was not open. Friend thanks for the letter. Also we wish all good. The brick color of the tower is much more beautiful than the 19th century cathedral. Quel dommage! A stunning and authentic bell tower. I prefer the older tower too! You are fortunate to be able to visit Europe so often. I want to return too Stuart, and spend a little longer in the area. That’s a shame about the downpour. Travel always throws some type of obstacles and I find you just have to go with the flow. Nice place. I was there when I was really small, although I really only remember the Pont du Gard. Never mind Avignon has a nice bridge too ;). Are there steps in Tour Fenestrelle? And if so, is it allowed to climb them? I love seeing pictures of places that are off the tourist-map, if not completely off the map. I think there are a lot of amazing places that no one looks at, just because they are not where everyone goes and photographs. I often think for most extremely touristy places you can do what my grandmother said: “I don’t see why I should spend money on travelling. I can just see those on TV and peel potatoes at the same time.” But you won’t see little jewels like these on TV. Uzes is less visited, but I don’t think it is that far off the tourist radar. There are so many beautiful little villages around Provence that I would love to get lost in! As my uncle would say – something to visit on the next trip. The window tower oddly matches the description I had made in my mind when I read Tennyson’s The Lady Of Shalott! Strange how your mind conjures up images isn’t it? 🙂 Thanks Nabadip. From below the tower is already grand and amazing. The view from the top in one of the windows must be breathtaking. Beautiful images with a rich history. Thanks. Have a blessed day. What lovely architecture! Love the round tower, Madhu. Do you speak French? Is it different in different regions? We are already thinking of going back…. No I don’t speak Fenchl. Have been meaning to learn, just haven’t found the time. We didn’t notice any marked difference between Provence and Paris or even the Cote d Azur. As always thanks a lot for taking us to a different part of world. It’s sad that you could not make to Pont du Gard and you missed the Saturday market! It does resemble the leaning tower of Pisa. I d never heard of the Uzes, will try to keep that in mind when we plan a trip to France. Been in Languedoc a couple of times – never found the cathedral that beautiful and interesting as on your photos here – can see that you have a passion for churches and what they mean to history. Great job. I did not realize that round towers were uncommon in France. I will have to ask some of my French friends. It looks completely different peaking over the cathedral than when you see it in isolation, Madhu. What a cunning way to enter Jake’s Sunday Post. I almost missed that. Gorgeous, Madhu. One to put on my list, i think! I think shopping in Provence is the best ! Great diversion I think. An absolutely stunning piece of architecture. Thanks for the wonderful history lesson as well. By the way, I was having trouble downloading your posts earlier, the images wouldn’t open at all. You might want to look at re-sizing larger photos. Stunning architectural shots, Madhu! Tour Fenestrelle is beautiful! I like it more than Pisa! In fact, after standing there for a while, I have the urge to push it back into place! Hahaha! Beautiful shots. I love how all of Europe is full of charming old buildings and towers, and unlike in India, so wonderfully preserved. What a pretty structure. It does remind me of the Tower of Pisa. I love architecture like this. 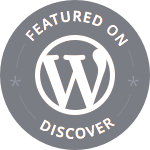 You have some of the most fascinating historical posts and you are a great story teller! Thank you for all your wonderful photo tours! Indeed that “window tower” shows such strong resemblance to the Leaning tower of Pisa. Except it is not leaning I guess.Tell me Madhu, is there some architectural link between this towers… and others? From my somewhat limited travels through Europe, I seem to recall other similar structures…. As always, I love the beautiful synergy you bring between your text and the shots. Thank you. These are impressive photos, Madhu. I have never been to the south of France, but the summer before last my daughter Bea brought home pictures of herself and her friends swimming beneath the Pont du Guard. Another place I must add to my to-go list!